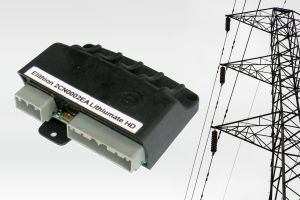 The BMS uses a Master/Slave topology; the Battery Master communicates with its Slaves wirelessly through radio waves. Cell sensing is wired: each slave senses the voltages of its cells through a number of tap wires. Isolation is provided by the wireless link. 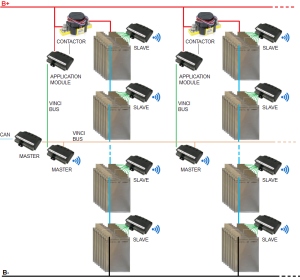 The BMS uses a Master/Slave topology; the Battery Master communicates with its Slaves through a 5-wire VinciBus. 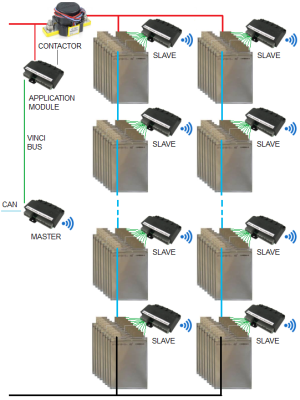 Cell sensing is distributed: a cell module is mounted on each cell to sense its voltage and temperature; each slave manages a bank of up to 25 cells through 2 fiber optic cables. Isolation is provided by the fiber optics. 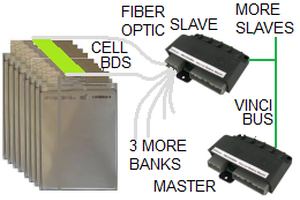 Two optic fibers go from the Slave to the two cell modules at the to ends of the bank. 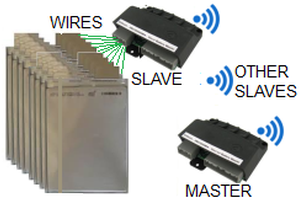 Wireless communications between the Master and the slaves. VinciBus. HV isolation Between the Master and the slaves, through a wireless link. Between the cell modules and the slave, through fiber optics. Policies - Contact us - Mobile site Page published on Oct 15 2018.